In a fantasy world far, far away, monsters ruled the land. Then came human’s all-out war in an attempt to seize the land. In its final days, they outwitted the monsters and succeeded in driving them into the dark mountains. Ever since, monsters were forbidden to step into the land again. If they were found, they would be captured and exterminated. For all these years, the two races have lived in their separate worlds, until the birth of a new monster king who would reshape the balance of power and bring in the new world order. I read quite a few sarcastic comments online after watching the trailer, and I was ashamed to say that I had similar thoughts. I thought this film would be one of those brainless slapstick that make me wonder why did I waste my time and money watching the film in the cinemas. I was quite wrong. This one picture ain’t gonna represent all the monsters in the film. But you can’t deny that the monsters aren’t exactly the dark and scary ones you normally see. Done by the creator of Shrek, the cute Monster baby kind Wuba will most likely remind audience of the cute alien from CJ7 (2008). Cuteness overload aside, the film is pretty hilarious. While I’m not exactly someone who is easily amused by lines and plots, Jing Boran, the orphan from Andy Lau’s Lost and Love now found a new village to stay in (he’s an orphan here too). His chemistry with Xiaolan (Bai Baihe), a low-ranking monster hunter was pretty cute, albeit cheesy. All roles were reversed in this film. Man get pregnant here, woman is the martial arts expert here. I was tickled to tears by the interesting interaction between the two and of course, with other veteran actors. I guess what made the film so different ( it being the biggest Chinese hit ever) was how the film made the bad guys not that bad, and the good guys not so good. It is definitely not a film about morales nor with big learning lessons, something pretty surprising for a Chinese film, which is nice for a change, but it is also the reason for the somewhat weak plot. I still like this unconventional story for it’s simple monster-language singalong, girly-cooing at the adorable Wuba and also the hint of parental love, which is a tear-jerker. Kai Ko was originally cast as the male lead, the filming was completed and scheduled to be out during the Chinese New Year period in 2015. However, due to the drug incident in Beijing, Kai Ko was banned in the media in China. After estimating the cost to digitally alter Kai Ko’s face, the producers Doris Tse and Kong informed Hui of the decision to reshoot the film with a new actor in place as the cost was not only higher than the reshoot, the Chinese authorities were also unwilling to show the film with a drug-using headliner anytime soon. 70% of the work had to be refilmed and 25% of the special-effects work had to be redone, they had to call back the cast and crew, find a new leading man and rebuild sets. The roles of the lady boss and the chef was changed to Tang Wei and Yao Chen in the reshoot to boost the movie’s popularity. Two kids cameo (Cindy Tian and Zhang Yuexuan) who participated in the first season of China’s “Daddy, Where Are We Going?” (爸爸去哪儿) reality show were also included too. Sandra Ng, Eric Tsang, female lead Bai Baihe and many other characters did not receive additional pay for the reshoot. As there weren’t enough time to redo the effects, the team had to fix the old and new scenes together. As the main action animation of the monster Wuba had already been completed in the original shoot, during the reshoot, Jing Boran not only has to do pretend acting with the monster, he had to accommodate with the pre-completed effect and copy Kai Ko’s every single action so that the effects can be added easily. Thus, this restricted Jing Boran’s movement and way of acting. Despite the hiccups, Monster Hunt is the highest grossing Chinese film of all time in China, as of July, 2015. Kong said a sequel is already in the planning process. He had hope to make this a trilogy and start filming it at the end of the year. Check out Monster Hunt (捉妖记)Weibo Page. 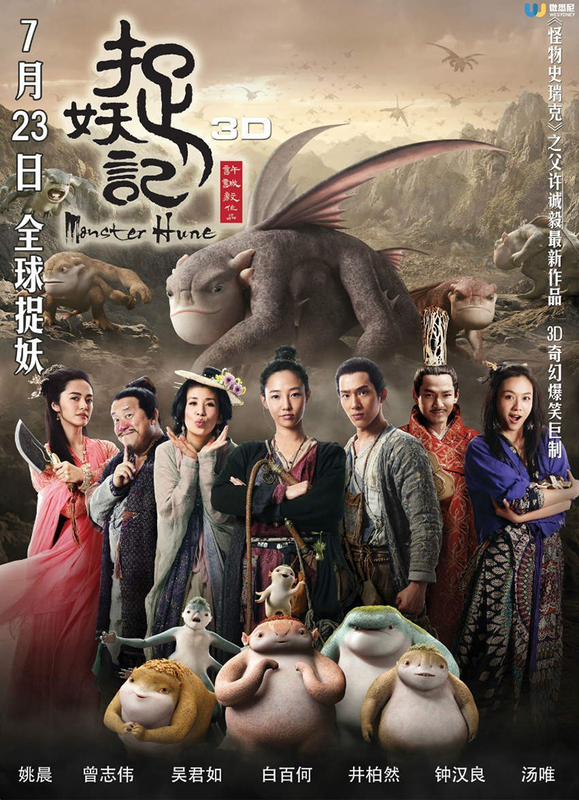 Monster Hunt (捉妖记) is out in cinemas on 23 July 2015.
that monster looks very cute! I can imagine a cute little plush made in it’s image. But then, this does not read like that kinda movie that will be selling plush? The creatures look so cute! My daughter will enjoy watching this. Hope this has an english dubbed version. Glad to know you give a very high rating for this. I want to watch this too. First impression is the monsters are so cute! This movie looks nice and these little monsters are cute indeed. Not sure whether i can take my kids along to watch it. The monsters in the show looks cute but I somehow can’t bring myself to watch this… animated monsters and Chinese film… I just can’t reconcile the 2 genres together, haha! It went pretty well actually~ big surprise for me too! It looks like a really cute movie with the characters. It looks to have interesting story and unique character developments. saw the trailer, and the ad, and i decided i’ll never ever watch this. i’m really surprised by the ratings here! I agree with what you said. Because I didn’t catch it till 1 mth later too! I’d say this seems to be a cute movie! The monsters don’t look like monster to me. I’m excited to see the graphics and the effects. I hope this show Monster Hunt here in my country. Now, this is interesting. This would be my first time to hear a Chinese movie that doesn’t involve dynasty stories; rather, a monster fantasy? I’m so curious why it deserved 4/5 rating from you. The pregnant guy and cute monster are enough for me to want to watch this film so bad! I hope they show it in Manila! I’m a sucker for this kinds of films! So is it similar to “How to train your Dragon?” or is it completely different? The monsters are very cute!